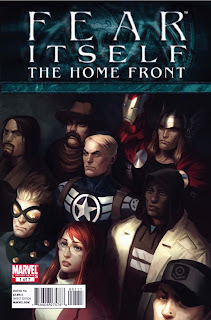 As with their big events as of late, Marvel likes to have a companion comic to go with the major story that focuses on how smaller-name characters and regular folk are impacted by the major happening. Hence, we now have this mini-series that is an anthology of sorts with four different stories, two of which will be continuing and two that are one-offs. The quality of these stories varies dramatically to say the least. Within this collection we get a Speedball story written by Christos Gage that I enjoyed a lot. Maybe that is because I've enjoyed reading about Robbie Baldwin since he was in New Warriors and during Civil War where he became Penance and wore that costume during Thunderbolts and the Penance mini-series. It makes sense to hae Christos Gage writing this as he is currently writing Baldwin in Avengers Academy and he has a good grip on the character. The only thing is, this story seems to contradict that issue, in that the people of Stamford seemed to have forgiven Baldwin, but here, through some plot twists where he is revealed as Speedball, they are pretty mad at him still. 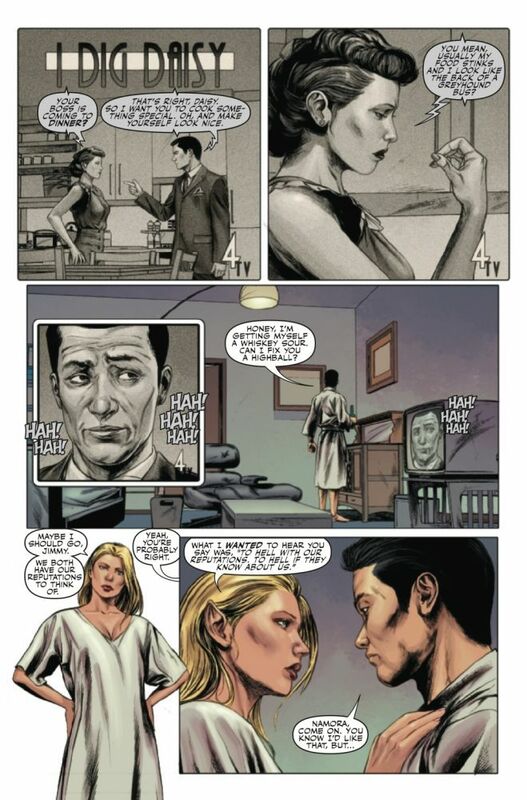 Gage himself acknowledges this as a "Not everyone in the town is cool with him," plot point so I guess its okay," and it is a pretty good story, probably my favorite of the issue, with good art even if the face scan look a bit wonky now and then. This is a seven-part story so I'm interested to see where it will be going as it will run throughout the whole mini. 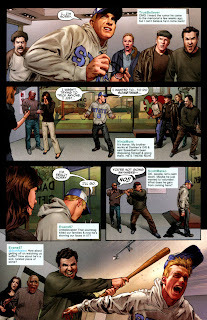 Up next is my least favorite story, with Peter Milligan writing Jimmy Woo of the Agents of Atlas. I'm not one of those people who think only Jeff Parker should be writing the Agents of Atlas--hey, if someone can do a good job, go for it--but Milligan just doesn't have a good grasp of these characters. He makes the Gorilla-man someone who beats up suspects until they talk, Woo a loser who is stuck living in the past, and the dialogue is so incredibly stilted that it made me roll my eyes up to the ceiling. I mean really, "In fact, I'm more than happy because I'm going to watch you all die there!" and I did not add the bold letters. I just really did not like this, and I enjoy Peter Milligan's writing when he's on (look at his good stuff like the Programme), but here, I'm just not impressed. There is then a short one-page story from the perspective of J. Jonah Jameson where he reflects on the riot seen in "Fear Itself #1" It's written and illustrated by Howard Chaykin and it is pleasant if short. 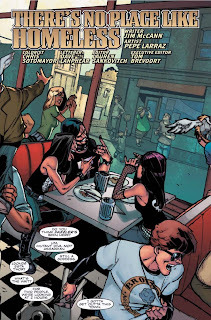 Following that is a one-part story featuring regular citizens of the town where the Gods of Asgard live where they talk about hard times and stand up to the rude tourists before it turns out to all be for naught as everyone leaves when the Gods take off (as happens in Fear Itelf #1). It was a decent story, showing how people stick together, but I'm not quite sure what the point was. Overall this is a decent enough collection, with my enjoying the Speedball story, and the one about the town-folk even if I didn't get the purpose. The one with the mayor was okay but so short it seemed pointless and I hated the Jimmy Woo tale. I guess overall that makes this a little bit above average. As for whether I"ll be getting the next issue; well, we definetely get more Speedball for sure, but we also have to put up with Jimmy Woo for three more issues and its a total crap-shoot what else we'll be getting, so I guess I'll be trying the next comic in this series out--although it will be with some trepidation.